In the summer season, Bratislava turns into an outdoors European capital that offers much more than just sight-seeing and good food. If you like the summer air, mingle with the crowds and take a walk around the city centre looking at Bratislava’s major landmarks, including the castle, which can be reached by a short walk up the hill, or by car or public transport. Summer also offers a great number of cultural events for tourists and locals alike. Most of the outdoor activities, events, projects and festivals planned for the summer months are organised as part of the Summer of Culture Festival Bratislava and Castle Festivities, running from mid-June to mid-September. The City streets are full of actors performing street shows. You can find a concert on every corner and stalls with craftsmen selling their products pop up all over the City, showing off local craftsmanship skills. If you are interested in handcrafts, be sure to visit during the weekend when the ‘Dni Majstrov’ (Craftsmen Days) are taking place in the city centre. This happens typically in late August or early September. ÚĽUV, The Centre for Folk Art Production, has been organising this festival of traditional crafts and craftsmen in various sites in downtown Bratislava since 1990. The event has gradually grown into the biggest city festival of its kind in Slovakia. Over two days, it offers gastronomy experiences, artisan demonstrations including workshops, as well as folklore music and dance performances. Go to the ULUV website for more information and the exact dates of the festival. Bratislava’s summer is also a time to remember the city’s history, mainly thanks to the annual Coronation festivities, which bring back the days when the coronation of the Hungarian kings and queens were moved to Bratislava’s St. Martin’s Cathedral between 1563 and 1830. The tradition of re-enactment of the coronation of a Hungarian monarch was renewed in 2003 – first inside the cathedral and later in the open air in front of a backdrop depicting the cathedral. These re-enactments are well-loved events and last for two days. 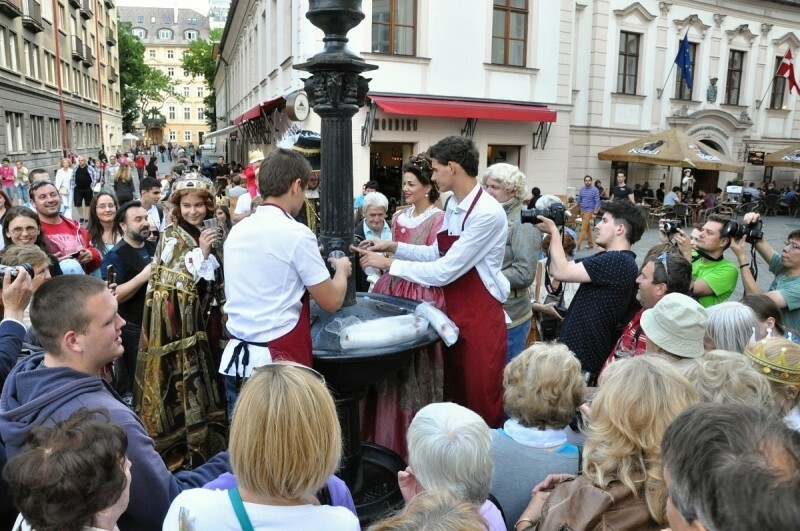 They include a coronation procession through the streets of the capital with dozens of actors in historical costumes, supported by many other events such as craft demonstrations and a historical ‘old-time’ market. More information can be obtained from the www.korunovacie.sk website. Early summer is also the time when the Festival of Frankovka Modra, which is the local name of Blaufrankisch wine, takes place. It is unique for its slightly strange wine tasting tradition – you can drink wine straight from a fountain which is said to have opened only once a year in the past. 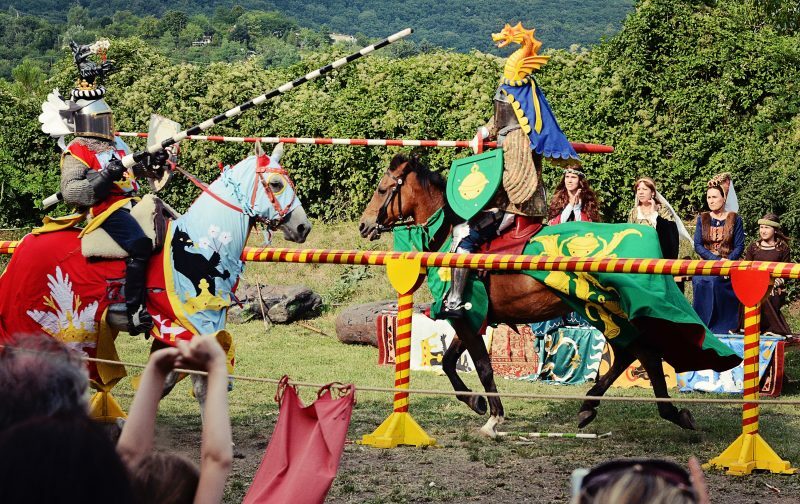 To get a taste of the middle-age culture, you might like to visit the festival of historical fencing, music, dance, and crafts at the Devín castle just outside Bratislava, easy to reach by car or by public buses. It is the place to be for enthusiasts of history, but also for families with children, who might appreciate the various live performances and workshops. The Devín Festival has been organised for more than a decade now, and it typically takes place around the end of August and is now regarded as one of the biggest festivals of its kind in Slovakia. As most of Bratislava’s theatres and concert halls are closed throughout July and August, many events that take place out in the open. The most popular summer events include the Shakespeare Days performed in the castle, an annual festival of Shakespearean theatre. Shakespeare’s most famous as well as less known plays are performed in the castle’s courtyard. Please note that they are performed in Slovak or Czech language only. For a language-barrier-free event, take a look at the line-up of the Viva Musica! Festival, a unique summer open-air festival that presents classical music in a non-traditional way. During the festival, classical music is performed in less than traditional venues and some of the concerts bring together unexpected mixture of genres – classical music, jazz, rock, or underground. The festival usually takes place in July. For more information, go to the festival’s website. Other music festivals that might be of interest include the International Guitar Festival of J.K. Mertz, the Slovak Folk festival of youth folklore troupes, the International Youth Music Festival, the Cathedral Organ Festival, or Music on the Danube with performances onboard a ship. Additionally, over the summer, chamber concerts take frequently place in the historical centre’s numerous courtyards. An interesting international festival of new circus, Cirkul’Art, has become a tradition over the past couple of years. It attracts artists and circus companies from all around Europe and beyond. The Medical Garden in the city centre is the venue of this event. For those who don’t want to give up sports even on a city holiday, the inline Bratislava event is worth attending. Every Friday evening in the summer, cross city rides on roller skates (and bicycles) are organised, with some of the city streets being closed for cars. The routes and starting points change every Friday, so you’d better check with the Tourist Board where to start. Organisers offer the possibility to rent roller-skates. The event is suitable for people of all ages. On a hot day in the city, a good open-air swim might come as a relief and delight. Try out one of Bratislava’s lakes – Zlaté Piesky, Rusovce, Lamač or Kuchajda. 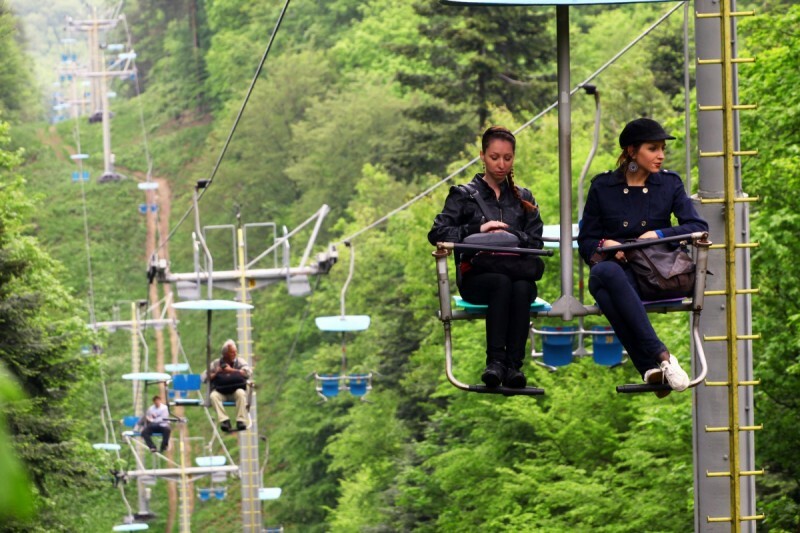 If you’re visiting Bratislava with your kids, they will appreciate a trip by the cable car from the forest park at Železná Studnička up to the Kamzík hill, where the TV tower stands erect above the city. A bobsleigh track is available in nearby Koliba resort. Another option is to take a Danube boat trip to Devín Castle or Danubiana Gallery in Čunovo. Please note that boats only between run between April and October.